Composer Armas Järnefelt (1869–1958) was Finnish by birth; he had begun his musical studies in Finland and had learned his profession as a conductor with the local orchestra in his native city of Viipuri from 1898 to 1903. From 1904 to 1907, he was involved in organising opera productions in Helsinki, mostly works by Wagner. He had acquired international experience while studying in Berlin and Paris in the 1890s, and prior to his appointment in Stockholm at the Royal Opera, where he was to remain in that post until 1932, he had lived in several places in Germany as his wife, singer Maikki Järnefelt, created a career there while he found employment as a rehearsal pianist and assistant conductor at various opera houses. 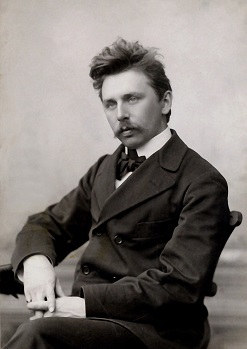 Järnefelt’s composing career was at its height in the 1890s, when he wrote his principal orchestral works, including the tone poem Korsholma (1894), the Symphonic Fantasy (1895) and a number of orchestral suites. He also wrote several solo songs and choral works that were quite popular, and later he wrote numerous sets of incidental music and a dozen cantatas. His best-known works by far are two charming miniatures: Prelude for orchestra (1895) and Berceuse for violin and orchestra (1904?). Stylistically, he straddled the divide between Finnish National Romanticism and international Late Romanticism. Wagner in particular was an important influence for him; he observed that as a young man he was possessed “by an insane Wagner fever”. In 1919, Järnefelt wrote a 100-minute orchestral score to Mauritz Stiller’s film Song of the Crimson Flower (Sången om den eldröda blomman) – first of its kind in the history of Nordic film industry. The restored score was premiered in 2017 and recorded by Ondine the following year.